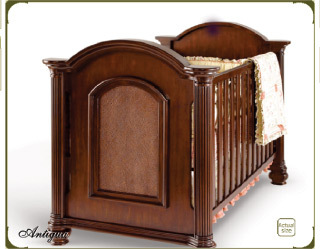 I'm not sure what this says about me or my psychological issues, but this crib absolutely terrifies me. Like, to a nightmarish degree. Back in the day when I worshipped everything spawned from the heavy, dark Victorian age, had lace doilies all over my bedroom, and pasted photos and recipes from Victoria Magazine on my mirror, I probably would have adored this crib. I probably would have wanted a replica of it for all seven (yes, SEVEN) of my Cabbage Patch Kids. I probably would have begged my parents for a matching four-poster bed, night stand, and vanity table. Looking at it now, it strikes me as something that belongs in a horror movie, not a nursery. There's something very The Changeling about it (the George C. Scott one, not Angelina Jolie's latest flick), and if I put my kid in it, there is no doubt I would eventually discover "666" on his scalp.